Point A is at crest of wave and point B is at trough of wave. Between point A and B, there are two crests and two troughs. v = f λ = (1 / 0.3)(36) = 36 / 0.3 = 120 cm/s. 3. The following graph displays the displacement of a point in one medium as a function of time when a wave passes through the medium. There are two wavelengths based on the graph above. 4. Based on figure below, the point that has phase difference ¾ with point A is …. Point F has a phase difference of 5/4 λ with point A. 5. On a pond’s surface, there are two dry leaves 60 centimeters away from each other. Both move up and down like the surface of the water with a frequency of 2 Hz. When one leaf is at the crest, the other leaves are at the trough, and between them, there is one crest and one trough. Determine the speed of the wave propagation of the wave. 6. 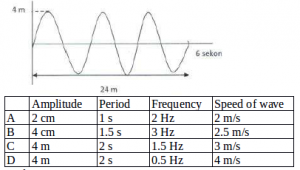 Based on figure below, determine the amplitude, period, frequency and speed of the wave. 7. On a string with length of 1.2 m and mass of 200 g formed 1.5 sinusoidal waves with frequency of 50 Hz. Based on these data, determine the wave period and the tension force of the rope.